↑ Malik, Rajiv. "Pride of India Swaminarayan Akshardham opens in New Delhi with praise from India's religious, cultural and political leaders". Hinduism Today. Satguru Bodhinatha Veylanswami. Retrieved 31 July 2013. ↑ "Swaminarayan Akshardham New Delhi". 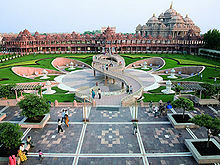 akshardham.com. Retrieved 2015-09-03. ↑ Sharma, Manoj (28 December 2007). "Magnificent monuments of Delhi". Hindustan Times. Retrieved 2008-01-08. ↑ "President to inaugurate Akshardham temple today". The Hindu. 6 November 2005. Retrieved 2008-01-05. ↑ "Making of Akshardham". BAPS Swaminarayan Sanstha. Archived from the original on 8 October 2008. Retrieved 2008-09-30. ↑ ক খ Malik, Rajiv (2006). "Pride of India: How Yogiji Maharaj's Dream Was Fulfilled (Interview)". Hinduism Today. Retrieved 2008-01-05. ↑ Williams, Raymond Brady (2004). "Swaminarayan Hinduism". Williams on South Asian Religions And Immigration. page 132: Ashgate Publishing, Ltd. p. 274. আইএসবিএন ৯৭৮-০-৭৫৪৬-৩৮৫৬-৮. Retrieved 2008-08-17. ↑ Malik, Rajiv (2006). "Pride of India: Swaminarayan Akshardham opens in New Delhi with praise from India's religious, cultural and political leaders". Hinduism Today. Retrieved 2008-01-05. ↑ ক খ Malik, Rajiv (2006). "Pride of India: How Yogiji Maharaj's Dream Was Fulfilled (Interview)". Hinduism Today. ↑ Arya, R.P. (2007). Incredible India: Tourist & Travel Guide. page 62: Indian Map Service. p. 320. আইএসবিএন ৯৭৮-৮১-৮৯৮৭৫-২০-৬. ↑ "Akshardham designers lauded". The Hindu. 6 November 2005. Archived from the original on 23 December 2007. Retrieved 2008-01-04. ↑ "The Akshardham Experience". About.com. 7 November 2005. Retrieved 2008-01-05. ↑ Moushumi Das Gupta (4 July 2007). "Games Village gets going as DDA clears lone bid". Hindustan Times. Retrieved 2008-01-08. ↑ Jha, Preeti (26 December 2007). "Guinness comes to east Delhi: Akshardham world’s largest Hindu temple". ExpressIndia.com. Archived from the original on 28 December 2007. Retrieved 2008-01-02.